The essence of such mods – to orient the player about the opponent, who began to cause damage to you. The bright, red semicircle, will show the direction and distance from which the projectile came. In the active, intense battle player simply gets lost and can not immediately understand where the shots made the ill-fated. Thus, lost precious seconds. To avoid this confusion we offer a damage indicator “Predator.” Because of its color, conspicuous mod on all types of maps. 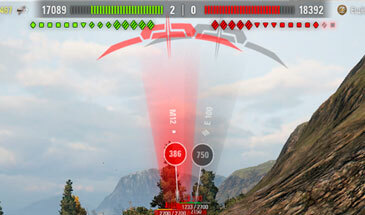 In the archive you will find the option indicator of damage to the display time of 15 seconds. Important! Whatever mod to work correctly you must enable the fire indicator in the game. Author of mod is zx80.